What does it feel like to win a World Championship title on home soil in an undefeated season? PROMISING. Last year I debated quitting the sport after my race in Auckland. I thought I didn’t belong. At the time, Jamie and Patrick told me to take a week and just think about it and reflect on what I wanted out of the sport and if I wanted to continue. It was a rough time for me; but ultimately, I decided to continue. To go undefeated a year later is encouraging. And, I am relieved I decided to stay in the sport. My advice for anyone struggling with something they love: surround yourself with those who will make you better. JOYFUL. One thing I’ve learned over the years is that I have to celebrate every single race! After the race, Red Bull hosted a party for my family and friends and me. It was incredible to be able to catch up with people I hadn’t seen since I left the USA in December of 2014. Thank you, Red Bull. Red Bull also got me the hardest reservation in town at world famous restaurant Alinea! If you follow me, you know that one thing I love is food, so to be able to go to the best restaurant in the world was the perfect celebration after a year of hard work with my husband Patrick. My favorite course was a “hot potato, cold potato” – I put it in my mouth and there was so much amazingness going on I could barely comprehend it! It was perfect – thank you, Brent Beck and Red Bull. SURPRISING. 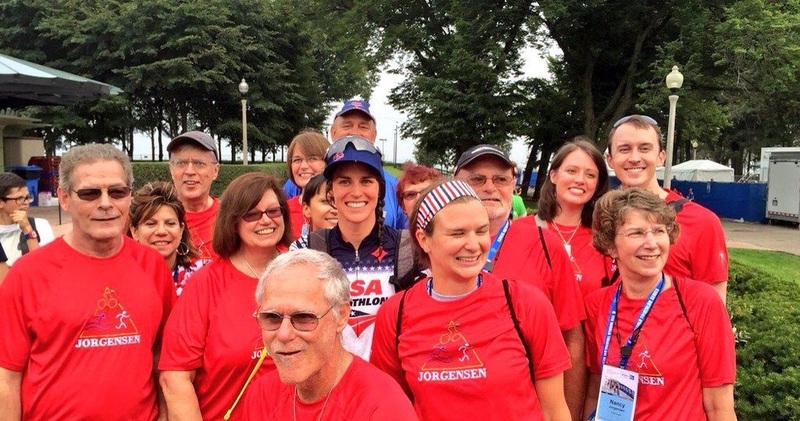 After the race, I met some amazing fans who traveled far just to see me race. It was surprising, but also exciting. I was blown away the following day at a signing I did at the Specialized truck. Fans stood in a line just to get a quick photo and signature. I’ve seen the sport of triathlon grow over the past years, and it is encouraging to see people passionate about triathlon. Thank you for coming out and amazing me. COMPLEX. I can tell you there is no ‘easy’ button to achieve success and there is not one thing that gets me across the finish line, but what I do know is I have the support of the greatest people around me. OVERWHELMING. I’m not sure if any other athlete feels this way, but the off-season is sometimes harder than in season. In season, I lead (in my mind) a very ordinary life. I train, eat, sleep, do emails, and watch Netflix. Other than that, I really don’t do much and much isn’t demanded of me (besides showing up ready to go at every training session). Now that the season is over, I need to adjust back into ordinary life and balance normal activities and sponsor engagements with training, which can be difficult. I love triathlon and I train for triathlon--what I don’t prepare for are media engagements. Over the next few months I will be traveling across the country multiple times for media and sponsor events. Thankfully, I’ve convinced Patrick to join me for most of the trips, and the trips usually include some amazing, once-in-a-lifetime experiences, such as us going to the Bahamas later this year with a sponsor, The Island House. GRATEFUL. I have so many people to thank. I would never be able to accomplish what I do without Jamie, Patrick, the Wizards, my sponsors, my physios and massage therapists, and my family and friends. To prepare for Chicago, Jamie along with Adam Radford (bike data specialist), tailored workouts specifically to prepare the Wizards for Chicago. Chicago’s unique bike course included many u-turns, so Jamie and Patrick went to an empty parking lot two times a week and swept away glass and put up cones to mimic a crit course. They would come home sweaty and with hands full of blisters, but they would never complain. The little things like that make it possible for me to perform. I would arrive at a cleanly swept parking lot with the other lady Wizards and we would push ourselves and test each other’s limits. It was an event that caught local Basque people’s eyes. I don’t think there was a day we did crits that we didn’t have at least one person stop and watch us – they were probably wondering what these crazy, English speaking people were doing riding in circles in spandex. EAGER. The season is over and it’s time to spend time at home. I am eager to spend time in St. Paul, MN, where I hope to go to new restaurants, do some cyclocross, go mountain biking on the river bottoms, and catch up with family and friends. These two help me more than anyone will ever know. Thanks Pat and Jamie!